It’s not a secret that loading speed really matters for both conversion rates and search rankings. User’s attention spans are inevitably getting shorter and shorter. Nearly half of web shoppers expect a site to load in 2 seconds and the majority of them will abandon the page if it fails to load within 3 seconds. Thus it’s worth to apply more efforts to speed up Magento store and use its potential to the fullest. The following easy-to-implement detailed step-by-step instructions will assists you immensely in Magento performance optimization. Upgrading to the most recent Magento version will help to improve website performance due to bug fixes and more advanced platform architecture. A manual setup usually requires tech savviness and a handful of time. Opting for a Сart2Cart automated service helps to avoid possible complications and lets you move accurately and securely products, customers and orders between Magento stores in no time. Cart2Cart offers seamless upgrade within all Magento versions for users best convenience. 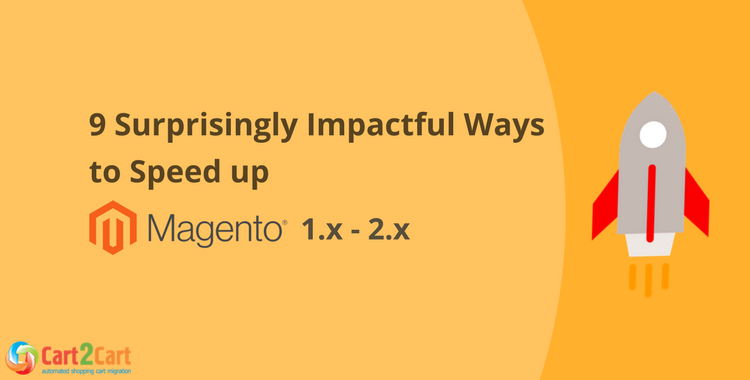 Here is a step-by-step tutorial on How to upgrade Magento to facilitate your efforts even more. If you are looking to optimize Magento performance selecting a reliable and fast web host perhaps is one of the most important steps to take. The main benefits a good hosting service provides is a high-speed connection, high security standards and easy-reachable support. All mentioned above will secure high loading speed, quick issue solving and minimizing possible inconveniences for users. One of the most efficient ways to speed up Magento is using PHP accelerators. Such plugins are designed for cashing webpage PHP scripts in their compiled state and improving their performance. APC (Alternative PHP Cache) is claimed to be the top solutions. It is a free open source caching extension for PHP based on operational code. Setting up APC plugin will decrease server load and shorten the time necessary for running scripts by skipping parsing and compiling steps and executing scripts directly from the cache. Image optimization reduces a website loading time dramatically. Since images make up to 64% from total page weight, compressing them will instantly speed up every single page. There are a variety of extensions allowing you to minimize image size without quality losses. For example, a good option is IrfanView. The viewer suggests rich feature-set and can be purchased for a commercial purpose for very modest fees. On the official Magento marketplace, you can find good free software like free Compress JPEG & PNG images plugin as well. There is also a huge variety of paid extension you can choose from. You can easily enable this function from a Magento admin panel. Choose System -> Configuration from the menu in the upper part. Magento offers an out-of-the-box compilation tool to compile all Magento installation files of your store. As a result, the page load time can be reduced by up to 50%. 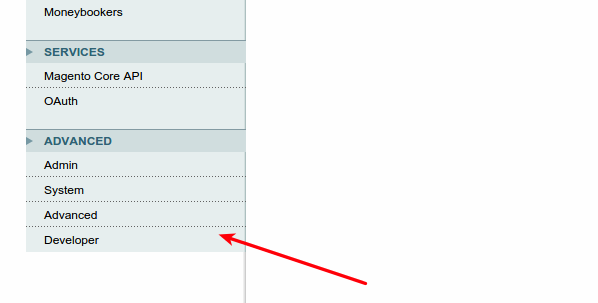 Hover to the menu in the upper part of the page and press System -> Tools -> Compilation. In the upper right corner press button Run Compilation Process. Magento platform offers two models to store customer and product data -- default EAV (entity attribute value) and flat. The advantage of EAV is the possibility to add unlimited custom attributes, but the downside of this model is that data is stored in multiple tablets. In order to retrieve the required information numerous queries to database have to be done and it results in a bit long response time, especially when there are a lot of products in the store. Enabling Flat catalogue for categories and products resolve this issue by merging product data in one table. This cuts down significantly on time necessary for database querying and speeds up loading of category and product pages. The idea is to add all the product and customer information to EAV and then switch to flat catalog for more efficient data management. 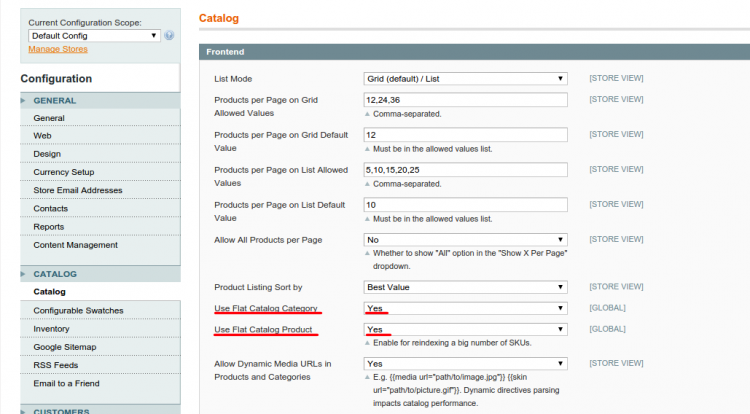 You can enable flat catalog from a Magento admin panel. In the left menu navigate to Catalog section and click on Catalog bar. Press Frontend panel and set Use Flat Catalog Category and Use Flat Catalog Product to YES. Caching is one of the best methods to decrease website load time significantly. When caching is applied, the website stores a cache of the user requests. If the user logs in next time, the website refers to this cache instead of making a new query to a server. 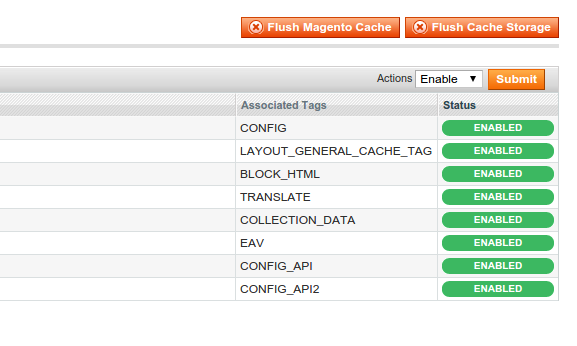 Magento comes with an internal caching module for its configuration, layouts, and blocks. Tick all cache types, go to the Action drop-down menu and select Enable. After click Submit button. Tick all the entities and choose Enable from a drop-down box and click on Submit button. Additional plugins and modules create an extra load on a server and make a website work slower. It is recommended to limit the number extensions to as few as possible to speed up Magento store. There is also a handy option to disable unnecessary modules from Magento admin board. For the unnecessary modules select Disable from the drop-down box and click on Save Config button. Navigate to the left bar menu and pick up Store ->Configuration -> ADVANCED -> Advanced. It will take you to Disable Modules Output section where you have to tick unnecessary modules and set them to Disable from a drop-down box. Taking into account current trends, the website load speed will certainly become one of the key factors determining conversion rates and Google rankings. All these methods implemented in a bundle allow to speed up significantly your Magento store and enhance user experience. Have you come across some other ways of Magento speed optimization -- feel free to share them in comments!